The Sparks put an emphasis on Championship experience in the draft, and they think they found some good fits. The Sun is happy with their draft. Minnesota accepted a second round 2020 draft pick from the New York Liberty in exchange for Tanisha Wright. Three-way trade: Nia Coffey to the Dream; Sugar Rodgers to the Aces; a second round pick to the Liberty. Looking back at the high school playing careers of several draft picks. Arike Ogunbowale is ready for her next shot, in the WNBA. Ogunbowale is about to get a taste of Texas yee haw. Wings CEO Greg Bibb talks about Megan Gustafson. Liberty rookie Han Xu has been compared to Yao Ming. UC Davis’ Megan Bertsch says thanks and readies for the WNBA. Sticking with the Sun won’t be easy for Regan Magarity. Chicago Sky coach James Wade considers the draft a success. Bridget Carleton is the Swiss army knife of the draft, Sun coach Curt Miller says. Mike Thibault shook up the draft again by selecting Kiara Leslie for the Mystics. Potential draftees need more than 24 hours to decide. Where does South Carolina stand after transfers? UTEP was undone by injuries this season, but have hope for the future. 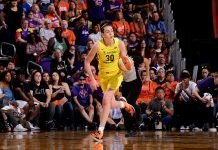 Sabrina Ionescu returns to Oregon with twin goals: a National Championship and a Master’s Degree. Four years later, the legacy of Nicole Munger and Hallie Thome. Brianna Tinsley is leaving Virginia for JMU. Kellie Harper is eager to return the Lady Vols back to prominence. Kim Mulkey has a history of putting her foot in her mouth. Northern Kentucky coach Camryn Whitaker was told in performance reviews to be more positive with players. Q&A with new Marquette coach Megan Duffy.